I saw this picture and initially laughed but then got annoyed almost immediately afterward. When I finished college I had a decision to make. I could go the safer route and look for a job right out of college or I could pursue a graduate degree. I knew that I had a better chance of getting married if I just had a bachelor’s degree. But I didn’t want to put my life on hold for something that I wasn’t sure would happen. I was 21 years young and without any hint of a significant other in sight. So I moved across the country, and started and completed a masters degree. But let me back up a bit. From a young age I was taught that good men looked for women who went to church and were active in some capacity. So during my masters program I found a church and started being active by singing quite often and taking on small responsibilities. Religion or maybe I should say church going, isn’t usually a man’s favorite pastime. It’s usually overrun with women with emphasis on emotions. We can’t forget that there’s a double standard for women. They are taught that if a man truly loves them he will respect them by respecting their vow of abstinence or celibacy until marriage. I have a theory that this kind of thinking lends itself to unrealistic expectations and very very bitter women. Needless to say, my “experiment” on getting a significant other was not successful and seemed to alienate myself even further from any serious prospects. I’ve never been one of those “I don’t need a man” women, but I can certainly understand some of the emotions behind it. An education can make women more critical as they will only pay attention to men that are on the same education level as them. I don’t think there are many women who want to feel like they are marrying down. Strike one. A very strong traditional religious mindset where you believe that you only need God and that’s it. 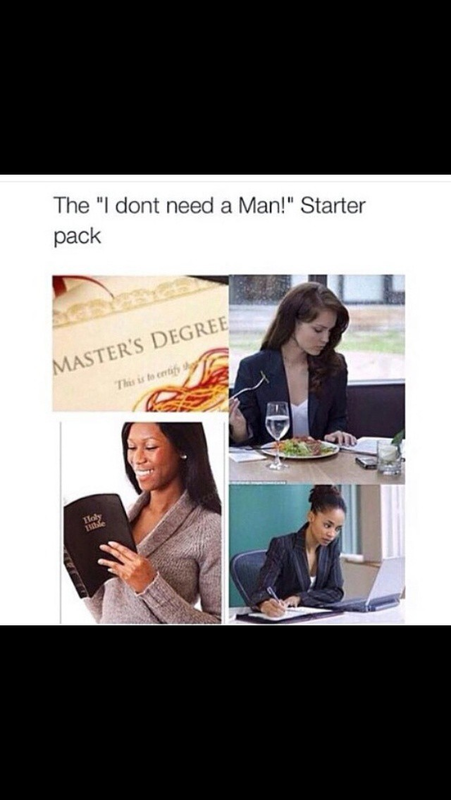 Couple this with a belief that good men are only found in church and will be happily celibate until marriage. Strike two. Let’s not forget about having a career and trying to move upward. Women in this position are usually planning to put child bearing off for a while because they want to be at a good place in their career. They put in long hours, they don’t date, they buy houses and drive nice cars. While they may be lonely, that feeling is remedied by more work and by girlfriends in a similar position. No man required. Strike three. There’s a hard truth to the picture and it’s not pretty. Perhaps it’s time to rethink some priorities and some expectations. Myself included. Lately I’ve been lacking motivation to work out consistently because sleep has been competing with work for my time. But that’s no excuse to not be active (or so I’m telling myself). For motivational (and curiosity) purposes I’ve been watching some of the show, “My 600lb Life.” It’s been very effective so far as a source of motivation for a healthy lifestyle. There’s something about watching someone be lifted by a crane-like device that will have you making a conscious decision to put down the junk food and go to the gym. One thing that I’m always looking at when I watch the show is the role of friends and family. Almost 100% they serve as enablers because they have to prepare the food to give to their family member who is bedridden because of their weight. There was one lady whose husband married her because she was bigger and he refused to support her weight loss despite the fact that she was unable to do anything due to her size. He still bought junk food and tried to make her eat it because he didn’t want her to lose weight. However, it was literally killing her and she wanted to be an active mother with their little girl instead of parenting from her bed. This caused an unbelievable amount of strain on the relationship as he continued to make snarky comments that were very hurtful about how she needed to gain more weight. The documentary ended with her deciding that she would take the verbal abuse for as long as she could before she would leave him. I doubt the marriage lasted long after filming because her husband had a very hard time adjusting to the new and more healthier her. I’ve actually seem this happen in couples where one partner decides to live a healthier lifestyle and it’s the straw that breaks the camel’s back and the relationship disintegrates. The other partner isn’t happy and finds themselves with a different person than who they thought they married and they can’t reconcile the two. So more often than not they start an affair. That’s why it’s so great if both partners can be on the same page and change together. It rarely happens that way but it’s nice when it does because they can support each other. I’ll be the first to admit that my spending habits are not always as disciplined the way that they should be. This story happened about two years ago so it’s not super recent but it was a very valuable learning experience. Anyway, one of the things that I’ve come to enjoy are comedy shows because I like humor. Anyway, I was at a comedy show and I got an SOS message from a somewhat close acquaintance asking me to call them as soon as possible. Now, because it wasn’t from a member of my immediate family or close circle I decided to wait until after the show to call the person back. So I did. Thinking that it was some big emergency I called as soon the show was over somewhat concerned. The emergency was the fact that this person wanted to borrow some money from me. Now, when that happens the answer is usually a straight “no.” I hate mixing money with friends and acquaintances and usually will just give it away and not worry about it instead of wrecking a relationship. I don’t think that it’s worth the hassle of lending it out. Now, it wasn’t an obscene amount of money—about a hundred and a half (ish). It was for a good cause and they promised to pay me back the next week. However intuition, common sense, and intelligence were screaming “don’t do it!! !” But, to be honest I was at a point in my life where I was still searching for reasons to have faith in humanity. I guess it was a personal thing. I wanted to trust that this person had good intentions despite the fact that I had known them for a few short months. So, I said yes. Against my better judgment and trying to have faith in humanity and taking a risk. Second mistake in this fiasco was that I let this person use my debit card for the transaction that they so desperately needed. Well, not my actual card but I gave them all the appropriate numbers deciding to trust that they were trustworthy. So the next day I awoke to a text message that informed me that this person had “accidentally” charged $100 more than I had authorized on my card. Being that it was a debit card, the money was already gone from my account. It was then that I found out that the money was actually for this person’s friend who (ironically) I actually knew personally. It was then that my feelings toward the situation gravitated towards significant irritation and annoyance. Mostly at the fact that there was a more noticeable lack of funds in my bank account due to my own stupidity and not making a smart decision. Needless to say, I was only reimbursed the original amount which left me $100 poorer and it was a bad situation all around. Lesson learned. I guess the icing on the cake was a few unauthorized charges that appeared a few months later on my account totaling about $200 that required the freezing of my account and the issuing of a difference card with the accompanying stress. Faith in humanity substantially shaken. They say an ounce of experience is more than a pint of advice and I certainly learned a lesson.